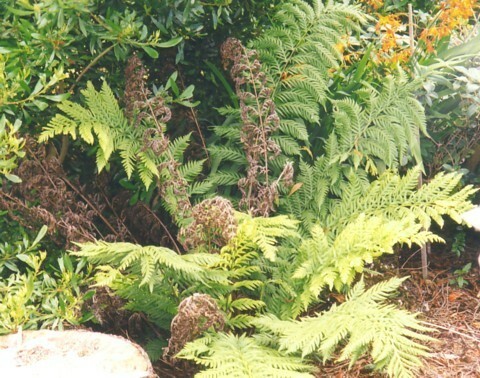 A small gallery of ferns that are not pictured elsewhere on this page. 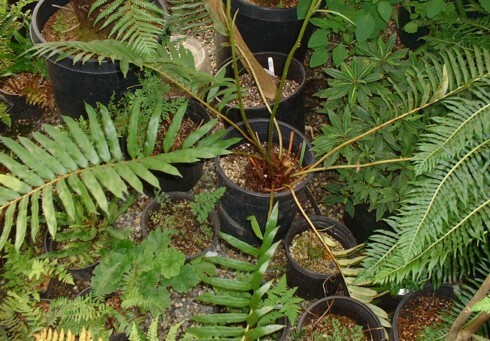 This Blechnum at Fancy Fronds Nursery, Gold Bar, WA may be B. tabulare. 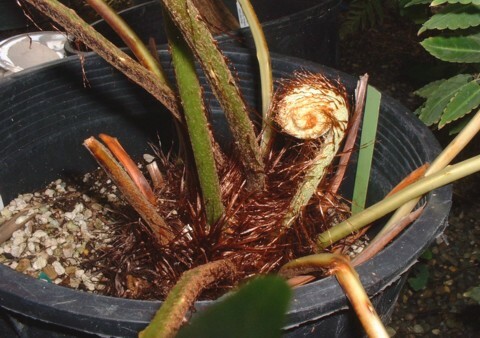 A wider shot of the above Blechnum. 6' tall Dryopteris wallichiana in my Olympia garden. 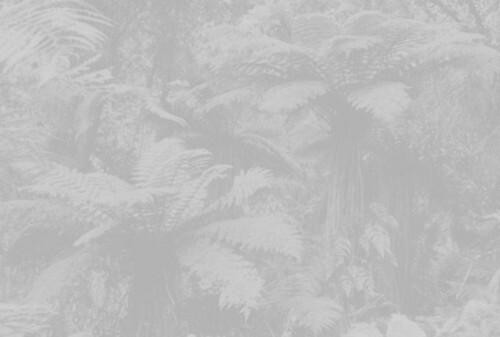 This is not a treefern at all, but it is certainly one of the most impressive temperate evergreen ferns and can look very tropical in the right setting. 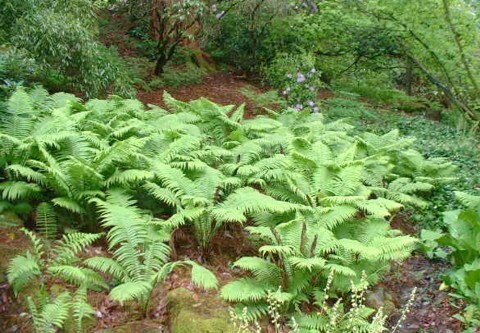 Woodwardia fimbriata, the giant chain fern, is a Blechnum relative native to the Pacific Northwest. 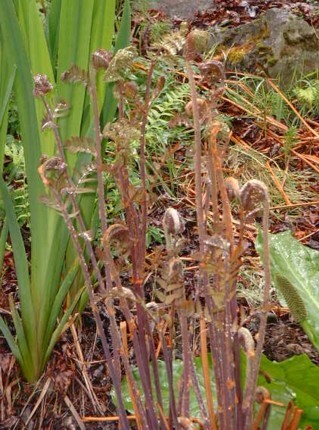 It may have fronds in excess of 9' long. 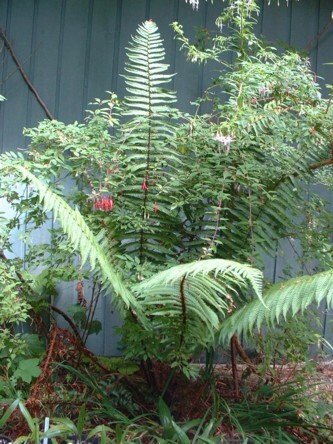 This plant grows in a garden in Yachats, OR. 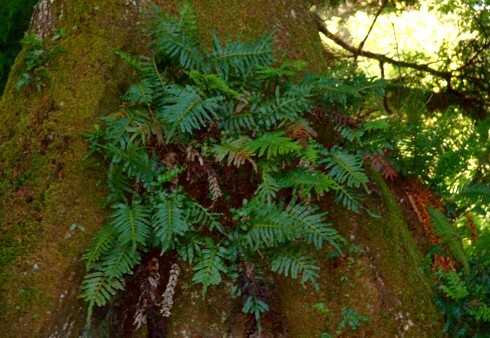 Polypodium scouleri is probably the most robust native epiphytic fern from the Pacific Northwest, and should be grown much more widely. Pictured here growing on a Sitka Spruce in a garden in Yachats, OR. 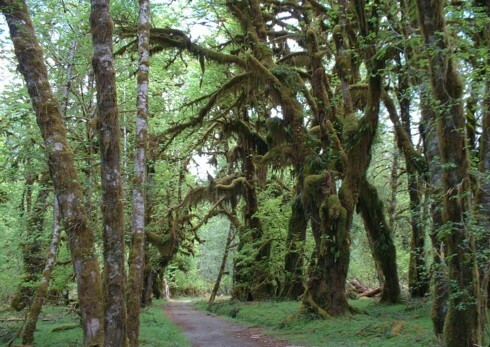 These Acer macrophyllum and Alnus rubra trees in the Quinalt Rainforest host (along with a whole lot of moss) the epiphytic Polypodium glycorhiza, which is the Pacific Northwest's most common native epiphytic fern. 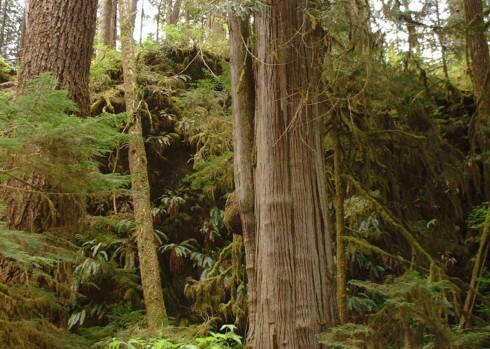 This is an area of the Olympic peninsula that receives about 160" of annual precipitation, but occasionally gets too cold for treeferns. Polystichum munitum growing among the redwoods (Sequoia sempervirens), Loeb State park, OR. 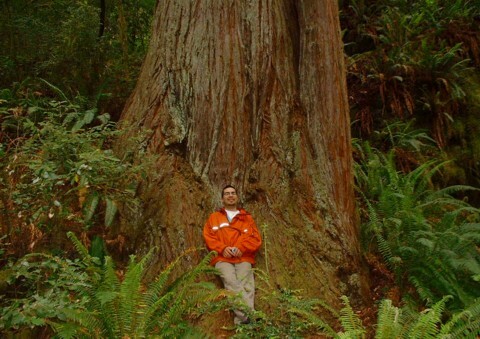 These temperate rainforests have remarkable species diversity and would be mild enough to accomodate some of the hardier treeferns. 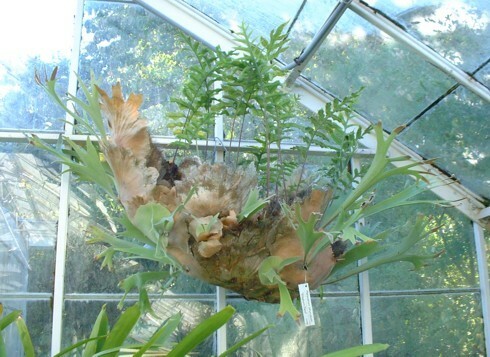 An enormous Platycerium growing with some other epiphytic fern in the conservatory ot Volunteer Park, Seattle, WA. Large ferns in the Washington Park Arboretum in Seattle, WA. 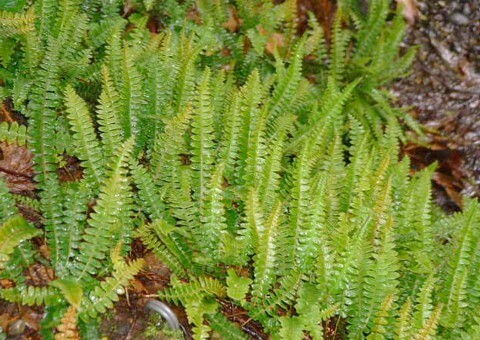 Blechnum penna-marina, a nice small-scale groundcover, at the Washingon Park Arboretum. Osmunda regalis coming up in the spring at the Washington Park Arboretum. 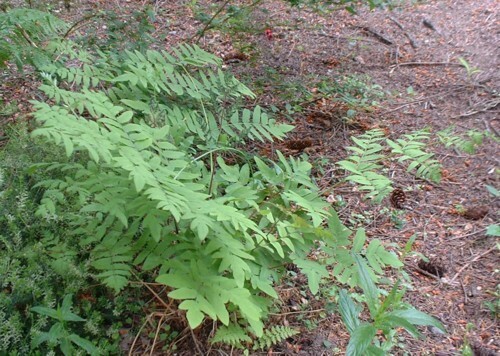 Osmunda grows fairly well in the climate of the Pacific Northwest. Osmunda regalis in my garden. 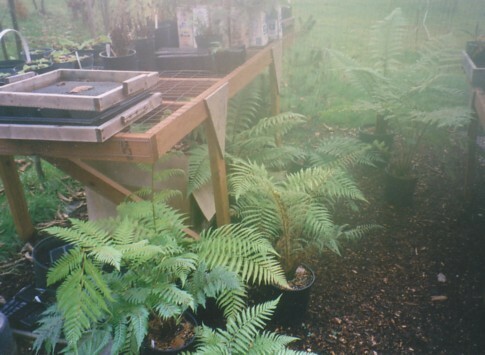 A picture from my treefern collection in 1998. 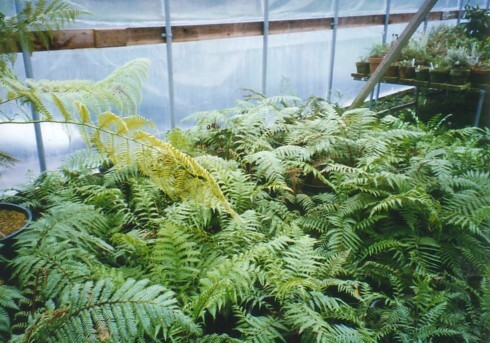 Young treeferns in pots, Fancy Fronds Nursery. The latest achievement in genetic engineering. What they didn't teach you in botany class. 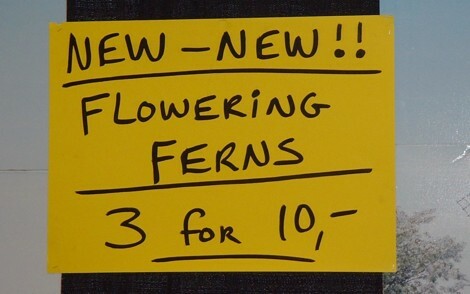 Or maybe, a vendor at the 2002 Northwest Flower and Garden Show in Seattle who is either very stupid or will do anything to make a buck (maybe both).